"Water Is Best" drinking fountain at the top of the Bigg Market, Newcastle. 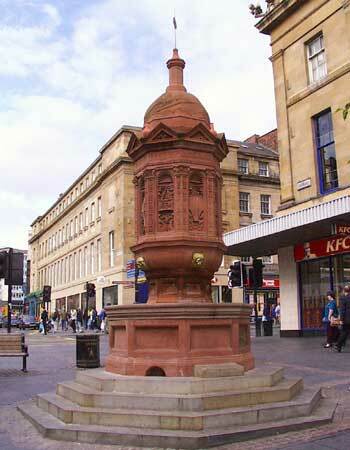 This drinking fountain, dated 1894, at the top of the Bigg Market (bigg was a particular kind of barley) was originally sited in St. Nicholas' Square. Erected by the Band of Hope Union in memory of J.H. Rutherford it contains the legend "Water Is Best" on a shield on one of the panels.